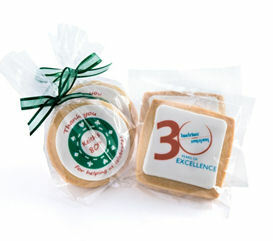 Print any image, design or logo directly onto our fondant topped shortbread cookies. We do not use edible paper. Set up charge $15.00, Subsequent photos $10.00. Available in 2.75 inch (approximate) Circles or Squares, 2 inch x 3 inch Rectangle or 3 inch wide Heart. Sealed with a sticker. If you want a heat seal that will add an extra 0.25 cents. If you want a Ribbon and Bow, that will add an extra 0.50 cents each. Click here to get back to main corporate ideas page.